it's always nice to kick off a new venture with free stuff, don't you think?! 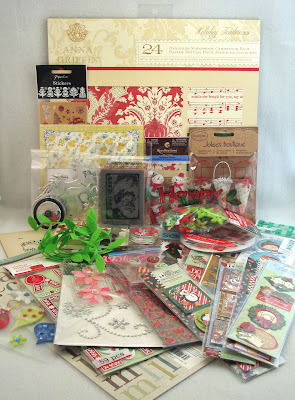 so we've put together a little prize pack full of christmassy supplies that one lucky winner will snag on january 31st! 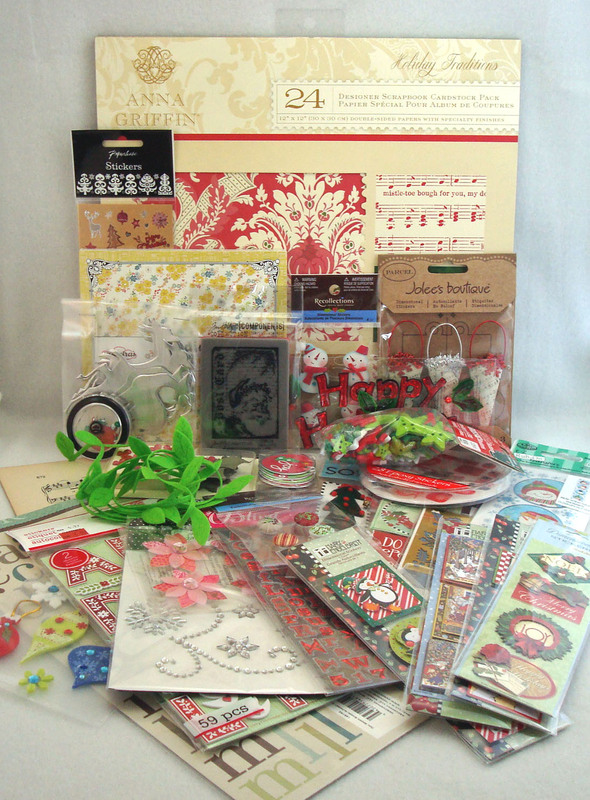 just the thing to help you kick off a whole year of holiday cardmaking! would you like to see a photo? ok, so it's not a *good* photo...but that's mostly because there were too many things to fit comfortable in my light box! ;) but hopefully you at least get an idea of what's up for grabs. HOW DO I GET THIS STUFF??!?! 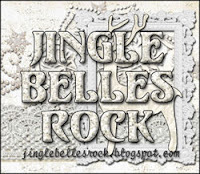 it couldn't be simpler: we'll collect entries the entire month of january; you get ONE entry for every comment you leave on any january jingle belles post. you get TWO entries for every *new* holiday card you link up to a january jingle belles prompt. on february first we'll announce the winner and one lucky jingle belle will walk away with the goodies! when did you finish making your 2010 holiday cards? c. i'm almost done! no, really, just a few more to go! let's make 2010 the last year we inflict last minute holiday card panic--or a fast and shamefaced trip to hallmark (yeah, we've all done THAT, too!) --upon ourselves, ok?! let's get real: we've all *SAID* we're going to do this before, haven't we? (lauren and stef have personally said we're going to do this every single year since we started making cards!!!) and we really did MEAN IT...but then somehow it didn't quiiiiiiiite happen. so lauren and stef thought: HEY!!! what if we all did it TOGETHER?! what if we publicly made this promise to ourselves...and then made it a fun promise to keep?! not a chore, but a creative challenge, a cool thing to look forward to every week?! let's make one little christmas card per week. let's make new friends and try new techniques. let's cheer each other on, inspire each other, get each other back on track when we need to, and just generally be excited about our common goal! see you on january 1, 2011!!! did they say *JINGLE BELLES*??!?! jingle belles is a meeting place for crafty cardmakers determined NOT to miss yet another december because we're still making holiday cards. 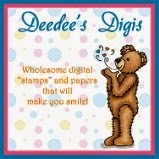 won't you join us in making ONE CHRISTMAS CARD PER WEEK during 2011 and avoiding the holiday mayhem??! when do the weekly prompts debut? what sort of prompts will there be? color inspirations, sketches, product-based ideas, technique-driven experiments, thematic approaches, song cues...hey, we'll try ANYTHING once...and the fun ones twice! who thinks up the prompts? are there other ways i can participate in the blog? yes! from time to time we'd like to invite readers to guest host, co-host, or guest design with us, so if you're interested, let us know! we've got a whole year to fill, folks, and we're open to suggestions! what if i can't make a card every week? then you will have less than 48 cards on december first. ...but... you'll still have 44 or 35 or however many you do make, and you'll still be way ahead of the game. despite serious OCD tendencies, even lauren knows it's *NOT* all or nothing, here! make a card whenever you have time and feel inspired; share a card whenever you'd like some encouragement and camaraderie. why not subscribe to the feed or bookmark the blog, though? who knows, you might unexpectedly see something that gets your holiday mojo going! are there going to be prizes?? can i sponsor a prize? sure! if you're a business person or designer with freebies to bestow, we'd love to hear from you! our contact info is on the sidebar. can i have one of your badges? definitely! g'head and take two, they're small! we are hoping to make lots of different ones during the course of the year, so feel free to collect as many as you like!